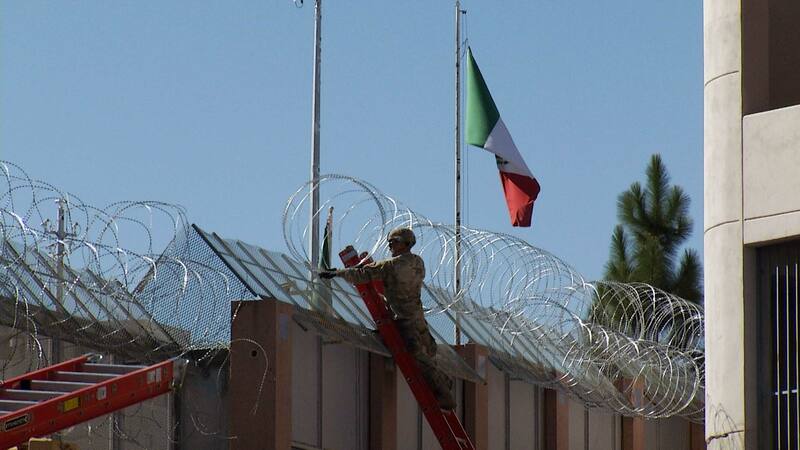 A soldier installs concertina wire along the border wall near the Dennis DeConcini Port of Entry in Nogales on Thursday, Nov. 15, 2018. A new deployment is expected to stretch an additional 150 miles of razor wire along the border. The Pentagon announced Tuesday that it is deploying thousands more soldiers to the U.S.-Mexico border. Committee chair Democratic lawmaker Adam Smith not only expressed doubt about this mission, but also the past two deployments. "When are we going to be to the point where you can say we don’t need active duty troops," he asked Under Secretary of Defense for Policy John Rood. "We look across the total force, active reserve and national guard to determine what is the right mix and appropriateness of the force to respond and that is where the decision is made in terms of the timeliness," Rood said. Smith interrupted, "Got it, so you don’t really know." Soldiers deployed last fall under Operation Secure Line installed 70 miles of razor wire along ports of entry into the U.S., meaning mostly well within downtown border cities. The new mission joins about 4,500 National Guard and active duty troops already deployed, and this domestic deployment is supposed to be funded through Sept. 30, the end of the fiscal year. It comes just weeks ahead of a deadline President Donald Trump gave Congress to come up with funding for 234 miles of border wall, risk a new government shutdown or face an executive action taken on the border to skirt Congress altogether.